SENATOR Aaron D. Ford Welcomes Crab Corner to Senate District 11! LAS VEGAS - Sept. 20, 2014 - PRLog -- Las Vegas, NV August 22, 2014 – Nevada State Senator, Aaron D. Ford, personally welcomed Crab Corner’s new location to Senate District 11. 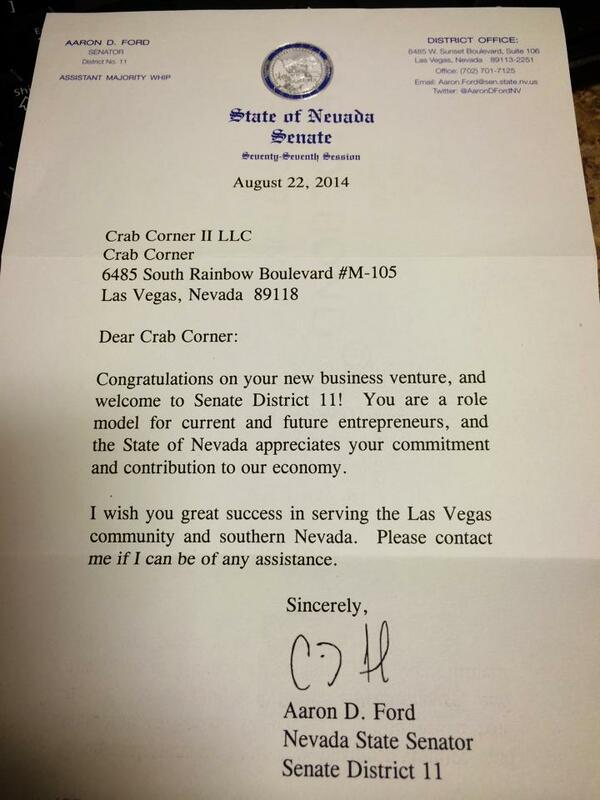 The Senator commended Crab Corner on being a role model for current and future entrepreneurs, and expressed appreciation for their commitment and contribution to Nevada’s economy. Crab Corner Maryland Seafood House has been serving the community with the freshest seafood since 2011. Their first location is located on Eastern Ave and Flamingo Rd. Due to its growing popularity, they opened a second restaurant on October 2013, which is located on Sunset Rd and Rainbow Blvd. The new location has a full bar and brand new video slot machines. Locals and tourist come to the Crab Corner to enjoy their signature Maryland blue crab cakes that has an astonishing 95% crab meat in it, Maryland clam chowder, mouthwatering oysters, and so much more. With affordable prices and daily specials, Crab Corner is the perfect spot for families and friends to come together and enjoy fresh seafood imported straight from Maryland.